One of the first childhood memories Toni Maria can recall is watching German soldiers ordering her father to dig his own grave. They shot him, quickly buried his body, and moved her family from their Abruzzi farm to a prison camp. Today, she still leaves a little bread on a plate at the end of her meal, to remind herself of the scarcity of the food provided at the camp during WW II. A vintage photo of Toni Maria, as she embarked on her nightclub career. Blessed with beauty, vitality, strength and a strong character, Toni made it though. 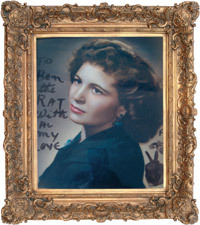 After leaving the camp, she became a nightclub singer, a chef, a restaurateur in San Francisco and a loving wife. Although she had no children of her own, her husband, Ben (her former meat delivery man who she met at her restaurant) more than made up for that by blessing her with six stepchildren. She loved them and they loved her, the beautiful meals she cooked for them and her understanding heart. 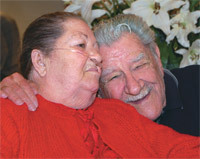 Living most of their lives in San Francisco and Pacifica, Ben and Toni learned several months ago that Toni was suffering from chronic obstructive pulmonary disease. She doesn’t have a long time to live—but she had a simple dream: To visit Cache Creek for a little gambling and to have a beautiful lunch at Kung Fu Fat’s, a Chinese restaurant located there. Greeted at Cache Creek by Veronica Wertz, volunteer coordinator and creator of “Dream of a Lifetime,” Toni was set for a fun afternoon. 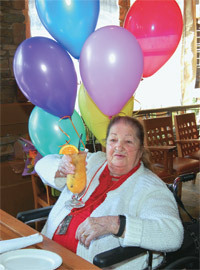 She looked up at Veronica from her balloon-decorated wheelchair in amazement when Wertz handed her $100. Then she played on the slot machines, one quarter at a time. “Once Veronica gave me the money, my hands started shaking,” she says. After gambling for about two hours, the entire family sat down to a fabulous lunch at Kung Fu Fat’s. The chef even came out with a specially cooked, spicy shrimp prepared just for Toni. They also shared shrimp balls, wontons, dumplings, pot stickers and Fat’s traditional banana cream pie. Toni regaled the crowd by singing some old standards from her nightclub days and telling a few jokes. After lunch, the woman who has always lived her life to the fullest went back to play a few quarters more. 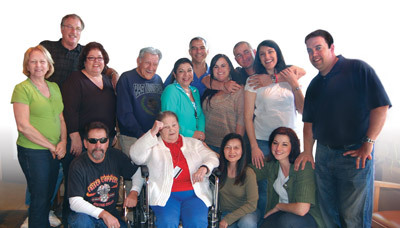 Toni Maria, Jerry Larson (see page 28) and their families were recipients of NorthBay Hospice & Bereavement’s Dream of a Lifetime program that grants wishes of the terminally ill. Begun in 2008, this is one of the few programs nationwide that fulfill the final dreams of adults. To find out more about this special program and its rules and guidelines, call (707) 646-3575.